Store design with an integrated sales piece of furniture for adidas. adidas presents clever sales piece of furniture that is integrated into the store design of the new style rooms. It simplifies the ordering process and shows the collections’ expansion digitally. 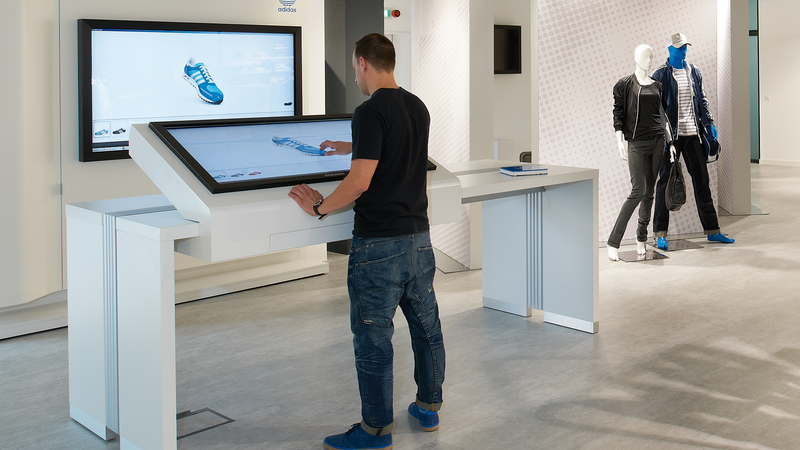 The functional sales piece of furniture, VSiT – Virtual-Sell-in-Tool, was designed especially for the adidas style rooms and perfectly blends into the store design. It acts as an ordering tool, which presents the complete range of the collection. It shows the products’ variety in their real colours and organizes and analyses them. Complete outfits can be put together and marketing actions can take place with it. Important information about the processing, materials, care instructions and delivery can be provided by the tool. Thanks to the digital access to the depth of products, resources, money and especially the environment are preserved. With this clever sales piece of furniture, adidas proves to be up-to-date and greatly simplifies the ordering process.